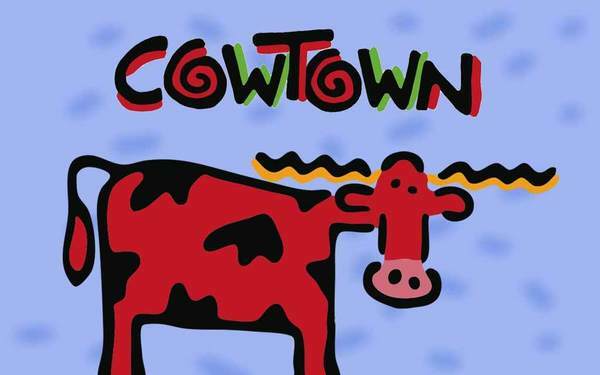 Cowtown is a hand-drawn, hand-painted, hand-lettered panel cartoon produced by Charlie Podrebarac since 1984. Cowtown is where cows, pigs, poultry, cats, dogs, ninnies, aliens, Elvis impersonators, Bigfoot, clowns and a guy named Bob interact in museums, bars, coffee houses, homes, offices, zoos, aquariums, casinos, hot tubs and yes, Bar-B-Q's. Speaking of the latter, Cowtown is also a Barbecue Sauce! Huh? Yes! Moo!